I was happy to cheat the rain again today. I didn't need my umbrella, but it may have made me more visible to cars. * I first walked northwest (back to Seafirth Rd., where I'd stopped walking yesterday), then turned around and walked southeast. I passed my car, and went south on Paradise Dr. to Paradise Beach County Park. I stopped at the Park for awhile, to walk down into and around the park (out to the end of the fishing pier), took some pictures of pigeons and the Bay. Nice to hear waves lapping on the shore. I walked back to the car, retracing my steps via Paradise Drive. *Note: Be very careful when walking along Paradise Drive. There are some blind corners where cars may not see pedestrians, and there are no shoulders to walk on in many parts. This was the third, and last, segment I walked today. From the car, I headed west on Trestle Glen, first north (as far as Mateo) and then south (to Seafirth Rd.) on Paradise Drive. I ran out of camera battery, so no pictures on this segment. I probably covered a lot more ground, a lot more quickly, without all the picture-taking stops, but I did make note of scenery I will try to capture next time. In this second segment today, I walked to Blackie's Pasture area, and around the park area. Eventually I took the fork of the Bay Trail going up Trestle Glen (double yellow lines indicate surface road/street), and saw some deer munching grass by the side of the road. There were also several robins (I hadn't seen a large group like this for years) going after clusters of red pyracantha berries growing close to the road. As a child I remember huge numbers of birds (before DDT and development killed most of them off) descending on these berries, getting "drunk" and bumping into windows. Unfortunately, my camera battery died, so no robin pictures. Note: There was not much of a shoulder on Tiburon Blvd. - Trestle Glen roads, so watch traffic carefully if you walk on this road. After many rainy days, it was great to see the sun today. I took advantage of the good weather and walked a few different segments. This is the first of three. Most of today's walking took place along city streets (shown as parallel yellow lines on map). 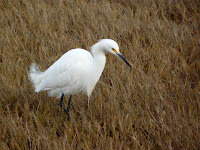 I walked by a marsh area and around a small cove (lots of birds), then southeast along Greenwood Beach Road. 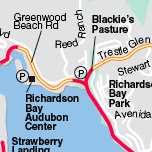 I stopped at the Richardson Bay Audobon Center and Sanctuary. and a small beach I walked down some stairs to reach. number of birds in this area. Today I covered much more ground than I usually do, in part due to the rain. This was only the second day I've walked in the rain. 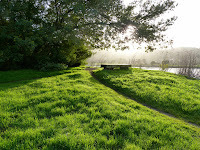 However, due to it being an "El Nino" year, I have a feeling there will be more days where I'm juggling an umbrella, a camera, a notebook, and other items, while out on the Bay Trail. Ah well, it certainly will be a nice green spring, from the looks of it. to do just fine in this weather. there, I saw what I thought must be a large bird bronze sculpture. take a picture of them from a distance (see image below). today's walk. Lack of rain also made for fewer puddles on the dirt path along Seminary Drive, which was nice (image at right). Great Circle and Century, which ended in a cul-de-sac. From this vantage point, I aimed my camera up over the rooftops, and caught a bit of the Bay and views of San Francisco skyline, between the houses. 2 Canada geese, 6 turkey vultures, 5 little brown jobs (LBJs), 5 crows, 47 coots, 34 ducks, 3 sea gulls, and 1 ball in the Bay. afternoon -- at the Bay Model that is. Earlier this month, I tried to visit the (US Army Corps of Engineers) Bay Model on my walk through Sausalito; but it was closed. Today we finally made it inside, and the Bay Model was -- as most people apparently say -- bigger than we expected. It encompasses the South Bay, Central Bay, San Pablo Bay, Suisan Bay, parts of the Delta and more. The idea for this model got its start back in the 1950s. Today, computer modeling has replaced the need for physical research models like this, but I doubt a desktop computer screen can convey this kind of scope. Thanks to Alec for joining me today. No wildlife today, except likenesses captured in short films, photographs, wall murals and other items. green grass sprouting up after recent rains. We walked up Shelter Bay, down Hamilton, over the 101 freeway overpass, down Seminary, and didn't quite make it to Strawberry Point. We got as far as the end of the smaller point before that, NW of Brickyard Park. On the way back we stopped at a local McDonald's near the trail for some water and a snack. 14 little brown jobs (LBJs); 6 Canada geese; 24 sea gulls; 23 ducks; 2 great egrets; 18 pigeons (all on McDonalds roof); 2 crows; 15 unidentified brownish shorebirds; 3 coots; 1 Western grebe; 1 snowy egret; and 2 balls. It was nice to get a bit of sun today, in an otherwise gray weather week. Tiburon. Nice views of the Bay, new green grass, trees, and Mount Tamalpais. I turned around to walk back before reaching the Highway 101 overpass. Walking Time: 3 hrs., 37 min. Today was a big mileage day, and I finished walking well after dark. enjoyable than the unimproved city streets or pathways. I was hoping to make it to the Bay Model today, but the building and exhibits closed at 4 p.m. I will have to try again at a later date. I did pass a few marinas, stopped at the small, but interesting Sausalito historical museum, and at the Cibo cafe for a pistachio macaron. I also enjoyed watching a sculptor building free-standing rock sculptures that seemed to defy gravity (see image for two examples). And speaking of sculptures, the two stone elephants (one pictured), near the Ferry boat area, are a classic Sausalito landmark. Today was a day with many stops. I visited the Discovery Museum for a few minutes, after a very nice tasting lunch at Cavallo Lodge restaurant. (See image for toy museum version of the Bridge and where I was in Marin County/Fort Baker.) Eventually I walked up the hill to East Road, and took a detour through the Eucalyptus forest and Fort Baker Chapel (see images), before heading toward Sausalito. 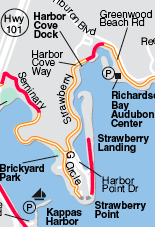 Today's walk was broken up into several little fits and starts, some areas not covered by red line (area under bridge, fishing pier, jetty, etc. ), all scenic. Due to what I'm sure are security reasons, it appears that you can't actually drive under (or get too close to) the base of the Golden Gate Bridge; although I approached this area on foot, first from top down (from Vista Point), and then from bottom up (from Fort Baker). 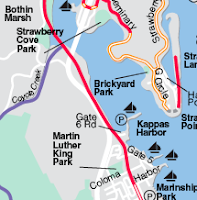 I also walked all along the shoreline of Horseshoe Cove, and out to Cavallo Point and the old Battery Yates area. Looking back into the Bay (which was shrouded by fog). It was easy to see why early explorers might have missed the true Bay contours for years. Today, I stood out there, and gigantic ships loomed out nearby, steaming in and out of the Golden Gate. Last, I parked up on East Road, and retraced steps to where I'd left off at Battery Yates, and then walked up the road a bit toward Sausalito. Thank you to the man who brought me a map of the Fort Baker area, from the (closed) Discovery Museum. 1 hummingbird; 5 little brown jobs (LBJs); 1 deer; 10 pigeons; 25 sea gulls; 2 tennis balls; 18 cormorants; 38 Western grebes; 6 ducks; 2 brown pelicans (flying together); and 1 blur in a bush. (although the bridge moves, making perfectly focused shots a challenge). 2 sea gulls while still light; however, no sightings after dark.